I saw my first mountain bike in 1985. The next year I had one, and have been pedaling ever since. My passion for the sport escalated considerably when I took my first bike shop job in 1991 and raced for the first time the following year. 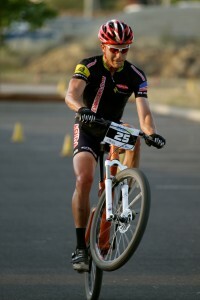 I have competed successfully in cross-country, downhill, cyclocross, and road cycling ever since. Over the years, I have governed cycling clubs, promoted events, and for the last six years spearheaded this race team. I have had the fortune and honor of winning many races and standing on several National Podiums, but my proudest moments are riding with folks I introduced to mountain biking and seeing first hand the joy it brings them! Today my passion for mountain biking is as strong as ever, and while I strive to be at the top of the endurance MTB racing, I am just as focused on developing our sport at the local grassroots level. I hope to see you on a bike ride soon!